In today’s furniture market, You don’t always get what you pay for. Recently I discovered 2 almost identical looking chairs whose prices were almost $400.00 apart. How can this be? I used to tell my clients that when purchasing furniture, you get what you pay for, unfortunately, this is no longer always the case. While It is still very rare to get an extremely well-made piece of furniture at discount pricing, it is not uncommon to spend a considerable amount of money for an item of furniture that is not well made at all. Some of the most expensive furnishings manufactured by well-established and trusted names in the industry are coming up short in the quality department. Gone are the days when one could be assured, by brand name alone, that the purchase was an item of exceptional quality. So how will one know if a hard-earned dollar is going toward the purchase of a quality item? For this article, we will focus solely on dining/kitchen chair construction. Later articles will focus on additional types of furnishings. The number one item that plays a factor in a chair frame’s durability is the type and quality of the joinery. A chair is an assembly of multiple pieces. A simple design can have as little as 8 pieces/parts, while a much more complex design can have upwards of 20. The way all those pieces are joined together will have a major outcome regarding the chair’s durability; if it will remain tight and together for decades, or quickly become an unstable wobbly mess. 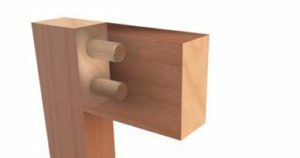 The most durable, desirable joints are comprised of wood, added for integrity and strength. These joints are glued together and clamped under pressure to ensure a tight and secure fit. 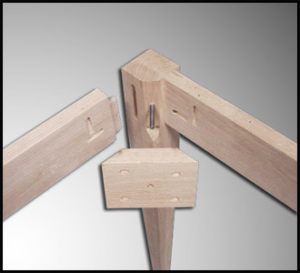 2 widely used examples of this type of joinery are “Mortise and Tenon”, and “Doweled”. For added strength, corner blocks are often glued and screwed to the seat rails. Corner blocks are added at the greatest stress point. These corner blocks are used to strengthen the seat corners They also prevent dowels from breaking under pressure. Inferior chairs usually come in the form of KD “Knock Down”. These chairs are generally shipped to the retailer in a flat box and assembled before delivery. Knock Down chairs rarely, if ever, contain any type of substantial wood joinery. 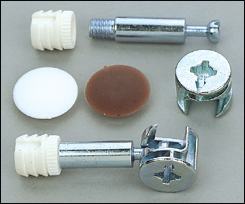 The parts are usually held together with some type of mechanical fasteners such as bolts, screws or Cam locks. They are manufactured to be assembled quickly, therefore, there are no glue joints or clamping. Due to the absence of wood on wood joinery and glue, this construction lends itself to a less stable frame, that with regular use will loosen and become wobbly in a short time. It is not uncommon to find chairs that are $200.00 and up constructed in this manner. It is very likely that this subgrade chair will start to fall apart in less than a year’s time. Some examples of hardware used in cheaply made, inexpensive furniture. So, how do you know if you are getting a well-made chair? First, ask the retailer if the chair is assembled at the point of manufacturer or shipped un-assembled. Unless the chair is going to be used infrequently I strongly suggest never buying a “KD” chair. Ask what type of joinery is used in the chair’s construction and if corner block is used for re-enforcement? If so, are they glued and screwed, or stapled? I strongly suggest staying away from the latter if possible. Flip the chair over. Are the bottom rungs or stretchers screwed into the legs? If so, this is a clue that points to cutting corners during assembly, that the chair joinery may not have been glued and clamped when assembled. Finally, what kind of warranty is provided? I cannot stress this enough; warranty speaks volumes to the quality and faith in the longevity of the product. If the manufacturer or store is unwilling to back their product for an extended period, Chances are it will not stand the test of time. This entry was posted in Uncategorized on April 17, 2017 by EliteAdmin.